“This is the most boring film about giant killer rabbits I’ve ever seen!” cried Fiona. “And, at the same time, the most interesting,” I suggested. 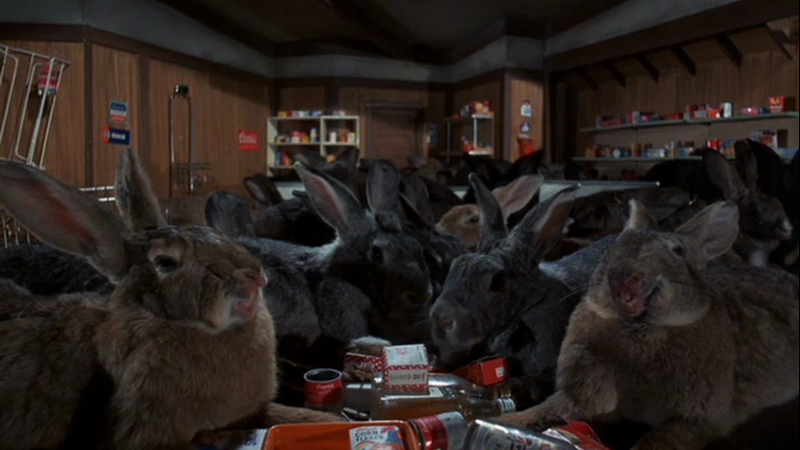 NIGHT OF THE LEPUS — how did this happen? We had to watch, in search of clues. 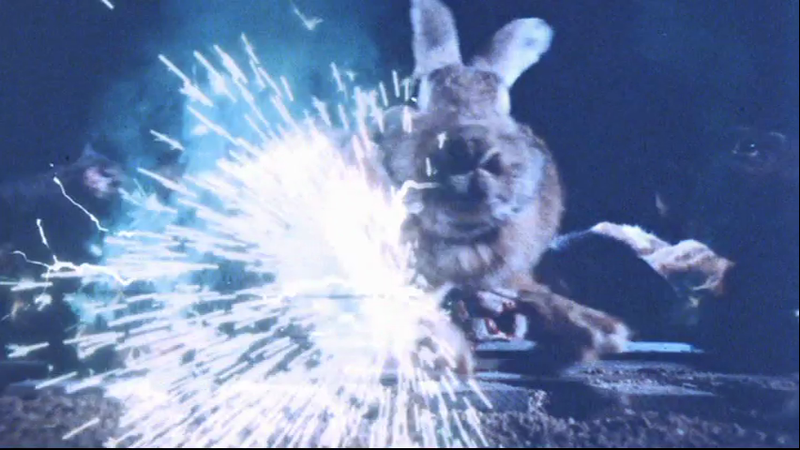 I formulated a half-baked idea that the novel it’s based on, The Year of the Angry Rabbit, must’ve been remarkably compelling, thus fooling a particularly gullible producer into thinking it’d make a good screen property. Throw in a batch of tainted cocaine and that almost seems plausible. But the book is a sci-fi satire, whose author, Russell Braddon, was well aware of the comic overtones of his chosen subject. 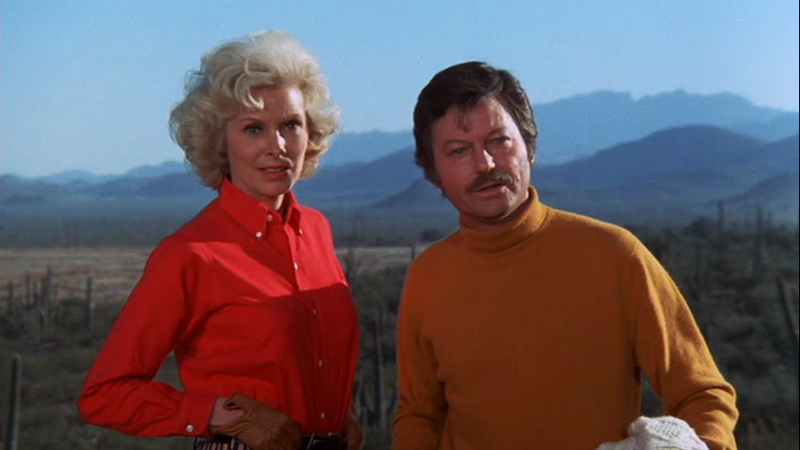 Somebody involved in LEPUS — hell, everybody involved in LEPUS — has decided to play it completely straight, an incomprehensible decision. The whole thing’s on YouTube. There are many cherishable moments, but I like this scene — a reaction to a scene of bloody horror, stylishly underplayed by actor Paul Fix at 5:20 in. I particularly like the ever-so tiny backward glance he gives the corpse — a look of… irritation. A sort of “You again?” look. Or maybe, “I was in SCARFACE, and now this?” Still, he would appear in PAT GARRETT AND BILLY THE KID a few years later. Don’t give up, Mr Fix! I can’t see DeForest for Ms. Leigh. 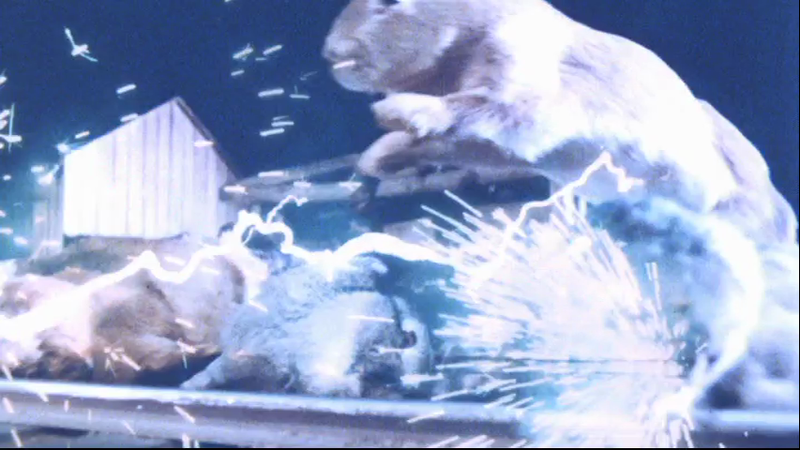 The ending sees the rabbit army destroyed by an electrified railway line, in a montage of positively Vertovian frenzy. 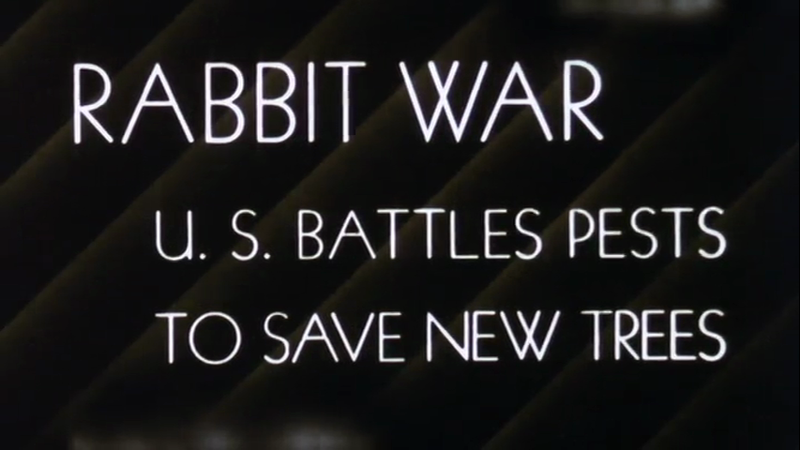 The rabbits are driven onto the tracks by an array of car headlights — we all know about rabbits and headlights, yes — recruited from a drive-in (the cartoon showing is a TOM & JERRY — obviously should’ve been BUGS BUNNY but this is an MGM release, not Warners. And William Claxton’s directing, not Joe Dante)… there’s humorous potential in all of that, plus a chance for a William Castle type address to the real drive-in audience watching, but none of that gets picked up. 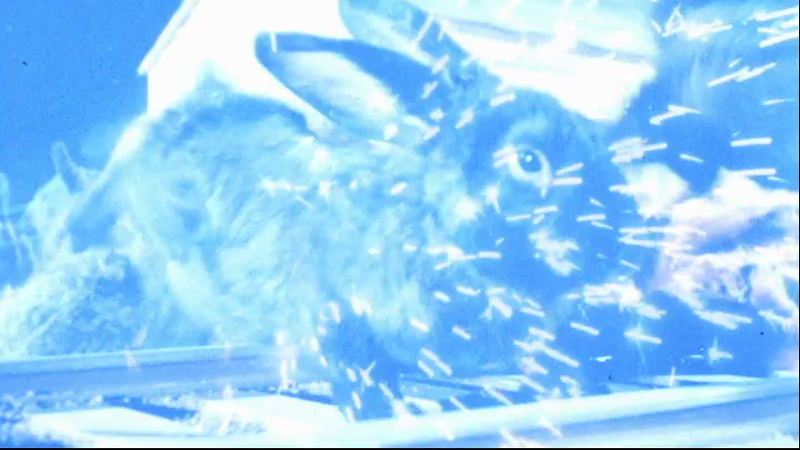 To call NIGHT OF THE LEPUS a missed opportunity would be… insane. But in a funny way, it is. Claxton and his writers (one of whom seemingly never worked again) missed their chance to make a knowingly ridiculous movie, and instead made an unconsciously ridiculous movie. The rabbits probably had a better idea of what was going on. Amazing shots of frying rabbits! It’s opticals and stuffed toys, I don’t think they actually harmed any rabbits, although I’m not making any promises. 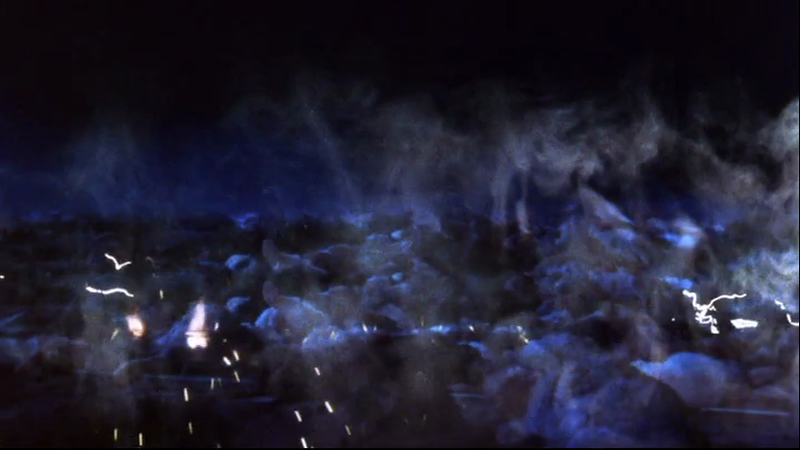 This movie was originally released in odorama so the smell of singed bunny fur… no. It even has an intertitle. So, we’re watching, then I have to take a Skype call (I actually can’t tell anymore if I’m watching this stuff for pleasure or to see Randy’s expression when he calls and I tell him what’s on) and after that I check my email and a correspondent has sent me a list of DVDs for possible swapping. I notice EVERY LITTLE CROOK AND NANNY and have to look it up because although I’ve vaguely heard of it, I don’t know what it is — Lynn Redgrave comedy — I only ever heard of it via seeing it in Halliwell’s Film Guide, probably twenty years ago. Resume movie — and on the marquee of the drive-in, the one the rabbit pack is rampaging towards, what do you think the main feature presentation is? Up until this point, I had thought the strangest thing about the film was, you know, its subject. David E writes, via FaceBook: Janet Leigh was asked about it once and she said “Well when I read the script it SOUNDED horrifying.” She wasn’t entirely wrong.